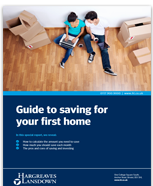 Find out how to reach your goal of purchasing your first home – request your free guide today. This guide is not personal advice. Download your guide to saving for your first home - simply confirm the last three characters of your postcode below. This guide is not personal advice. Please contact us for advice if you are at all unsure of the suitability of an investment for your circumstances. The value of investments can fall as well as rise so you could get back less than you invest. Getting one foot on the property ladder is often considered one of the biggest milestones in a person’s life. Rising house prices in recent times have made it more important than ever to develop a plan to reach your goal. What are the best options to consider when saving and investing?